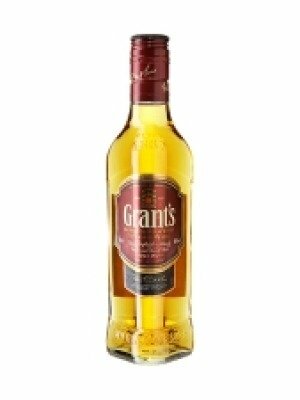 Grants Family Reserve Blended Scotch Whisky is a popular Whisky available from Tesco Groceries in 35cl to buy online. Visit Tesco Groceries for the best price for 35cl of Grants Family Reserve Blended Scotch Whisky or compare prices on our other Whisky products. Grants Family Reserve Whisky is a skilful blend of around 25 different whiskies from the finest single malts and grain scotch whiskies. It uses vacuum grained whisky making it lighter and more delicate, then aged in oak, giving it a deeper soft flavour. You can buy Grants Family Reserve Blended Scotch Whisky online in most retailers and find it in the Whisky aisle in supermarkets but we found the best deals online for Grants Family Reserve Blended Scotch Whisky in Tesco Groceries, DrinkSupermarket.com, and others. Compare the current price of Grants Family Reserve Blended Scotch Whisky in 35cl size in the table of offers below. Simply click on the button to order Grants Family Reserve Blended Scotch Whisky online now.